This is the kind of time where the leadership qualities will be tested. I am quite open to being tested on that challenge and hope to do the best in the interest of the bank. The agenda is consolidation. I think fast growth is not the right approach at this point (in time). What is important is that within the existing balance sheet, we should really improve the composition of our deposit structure. We should have more retail deposits; more current and savings accounts deposits. And we must continue to strongly monitor the credit quality. This is not in the context of ICICI per se but in the context of the way the economy is moving. The corporate sector is going through a process of adjustment and the retail customers, too, are going through an adjustment in terms of their income level. So, at this point of time, it is very important for us that the monitoring of the assets continues to get a lot more focus. When will you start growing your book? bb01d9ee-cd8c-11dd-a370-000b5dabf636.flvIn an economy, every change happens with a lag. The bulk deposit rates have recently corrected; now the retail deposit rates will correct. After this, the lending rates will come down, making loans affordable for the borrowers and then consumption and investment will start. We have not shut down any business but we will give the economic cycle the time and move at the right time. I don’t want to set any target. Are you rebalancing the portfolio in terms of paring exposure to retail assets and focusing more on corporate assets? At one point of time, the share of retail loans was 67% of your balance sheet. Now, it is about 55%. I would say that the mix would change depending on the business opportunities in each of the segment. I would not like to set a number and say we would want to get there. Each of the businesses should grow at a rate which is good, given the environment at which we are operating. The business mix will be a result of this. In the current economic scenario, on the corporate side, I still think that NPAs would not grow much because the corporate profits are still high and their debt levels are low. Currently, the firms are going through an adjustment process in terms of unlocking their inventories and cutting the prices and so on. But a quarter or two later, the whole cycle will settle down. They will start operating in a cycle where both the raw material prices as well as selling prices will be low and so they will have margins. Even though capacity utilization may not be 100% but that will be certainly better than what we are seeing currently when they are unlocking inventories. So, I think over a quarter or two, the adjustment period will come to another level and it will be a viable cycle. On the retail side, as long as India does not face any large scale retrenchment—I don’t think that will happen—and the scenario continues to be what it is currently, we will not have any worry on mortgages and car loans. On unsecured loans and credit cards, we have already seen industry-wide higher credit losses than what used to be prevalent a couple of years ago. I think we will have to learn to live with the little higher level of credit losses of such loans. Will you go slow on your international operations? Yes. Our strategy would be to focus on growing on the right resource mix and clearly therefore even on international operations, we would grow mainly on the basis of retail deposit flows that we get in the UK and Canada. Earlier, we had many other sources of funding which were driving our growth. In the current scenario, it is best to rely only on the deposit growth instead of a whole lot of debt for our international operations. You seem to be aggressively raising deposits. The push (for deposits) is important even though we may not be lending at the same pace. If we raise more and more retail deposits, we can pay back high-cost deposits. Is the worst over for ICICI Bank in terms of liquidity and your exposure to credit linked notes and other derivatives? How much more provision would you need? Let me put it in context. ICICI Bank is the second largest bank in the country and the environment in which it operates has a lot of bearing on the working of the bank. It all depends on how the global scenario moves and more so how the Indian scenario moves. That will drive the course for the bank. Today, no one is predicting on a long-term basis on what the economic scenario will be. Even in the most difficult liquidity time, we always have a rupee liquidity of Rs10,000-15,000 crore daily, barring may be 10-15 days. On the international side, our growth rate will be lower but we do not have any imminent liquidity problem. We have sufficient liquidity to take care of our operations. Six months ago, we had sold off all non-India credit linked notes and credit default swaps. As a banker, I would say that anything that happens to the economy impacts all banks. In the current scenario, one should never make a forward-looking statement. The Securities and Exchange Board of India (Sebi) has not seen any merit in your argument on your stock being manipulated. What’s the status of your complaint with the Economic Offence Wing? Sebi is most equipped to do the investigation and we respect the work it has put in and its conclusion. The Economic Offence Wing work is in progress. As we speak, it is looking at the evidences and assessing what action can be taken. Yeah. That’s going to be our target and we will have to work towards it. When do you see the pain getting over? Globally, it would take longer but for India, it would take a couple of quarters. Clearly, the corporate community is going through an adjustment phase. ICICI seems to be always partial towards women. Instead of saying the bank is partial towards men or women, I would say it is partial towards merit. 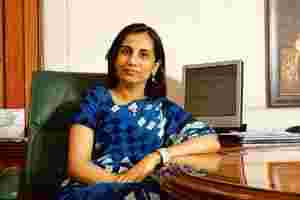 Clearly, the decisions in ICICI Bank are taken on the basis of merit and not on the basis of gender. The bank looks at what is the requirement of the job and which person fits the requirement the best and it does not matter whether the person is a male or a female. Will you reshuffle the portfolios of senior executives in the bank? Who will be your deputy? There will be no reshuffling in portfolios. Once I take over as the CEO, one director’s post will fall vacant at the board and we will fill that up. We have the advantage of a large talent pool across the group. Is there a possibility of reshuffling executives among group companies? The possibilities exist. We treat the entire group as one resource pool. The possibility of getting somebody from a group company (at a senior level) also exists. Finally, how easy will it be to fit in Kamath’s shoes? The way he has driven the organization, transformed it and the kind of impact that it had not only on ICICI Bank but the economy as such is something extraordinary. I should only draw inspiration and learn from them. Yes, definitely. But he will be there as a non-executive chairman for all our group companies. What do you want to achieve in your first five years? I would like to make a meaningful impact on the banking industry and our customers and shareholders.